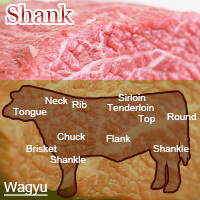 Beef shank is located in the upper portion of the inner thigh. It isn't tender but tenderer than beef taken from the outer thigh. It is mainly used to make roast beef. However, it can also be found eaten as sashimi, yakiniku, and steak. The calories in Japanese Beef Shank per 100g(1cut ) is 246 calories. Japanese Beef Shank is calculated to be 246Cal per 100 grams making 80Cal equivalent to 32.52g with 18.9g of mostly protein、17.5g of fat、0.5g of carbohydrates in 100g while being rich in vitamins and minerals such as Niacin and Vitamin B12.